Perfect Ham and Cheese Crescent Rolls, prepared with a soft dough and from scratch! 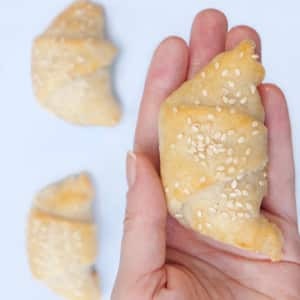 Everyone loves to snack on those stuffed crescent rolls and you can make them at home now. 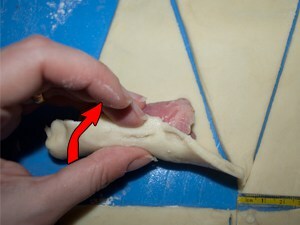 Learn how to make ham and cheese crescent rolls, step by step with the instructions further below. You will be in for a treat! 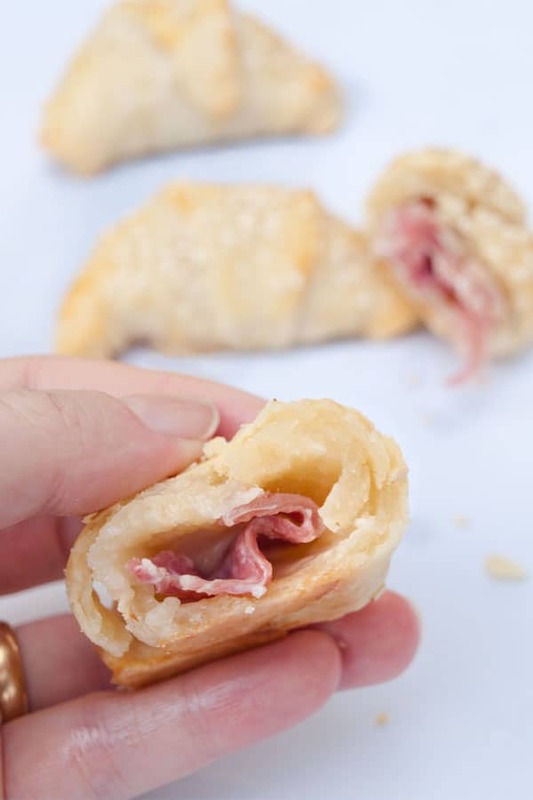 The stuffed Ham and Cheese Crescent rolls are for all those who love to bite into small savory pastries and for those who love a melting cheese moment combined with beautiful cuts of ham. These little crescent babies are special, I used a typical Central European dough variety known as Mürbteig or Short crust curd based dough. In central Europe, more precisely in Austria and also in Bavaria, we use a firm curd cheese in our traditional baking to make the dough lighter during the baking process. We call this popular curd cheese Topfen in Austria and Bavaria, while the Germans in the north would know it as Quark. It’s a semi-hard & soft, nearly tasteless Curd Cheese. It’s available in thicker and less firm variation. Topfen/Quark is frequently used as the main ingredient in cakes such as the Christmas Stollen and as I had mentioned earlier there is even an own dough variety dedicated to the soft Topfen, better known as Topfenmürbteig. Mürbteig means shortcrust in English, yet the shortcrust with Curd Cheese is not that common in the English speaking countries. Basically, it’s a curd based shortcrust dough. However, that shouldn’t stop you from trying out these amazing ham and cheese crescent rolls! You can still get semi-firm to firm curd cheese in your local area either in a brick and mortar store or you can buy natural online cottage cheese here to prepare the curd based shortcrust dough. Or you could also make your own cheese curds! How to make your own cheese curds for your own Ham and Cheese Crescent Rolls dough. add lemon juice to milk so that the milk curdles and the casein separates. Place the stuffed cheesecloth with the cheese lumps into a strainer over an empty bowl. Place your cheese curds in an airtight container. Store in the fridge but use within days. The ham and cheese crescent rolls are stuffed with cheesy melting goodness and make the perfect snack time treat. I also adore them as a little breakfast treat. 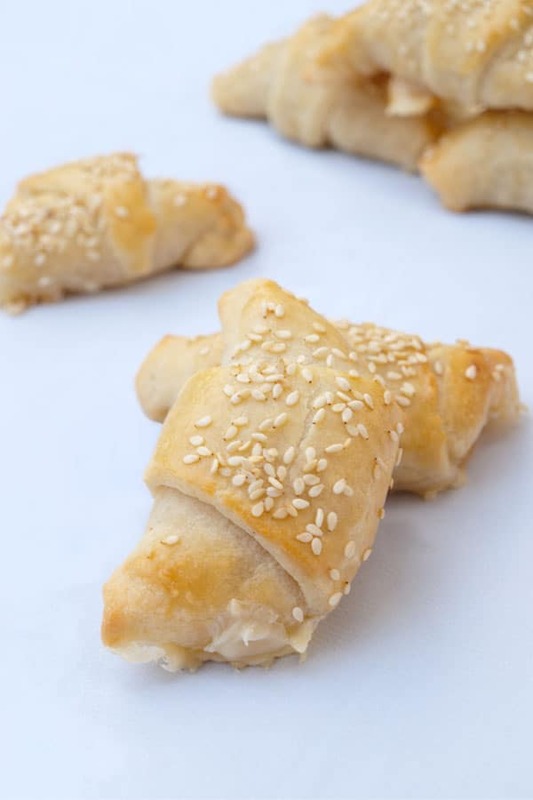 The dough in this recipe is prepared from scratch however you have the option of using store bought ready made dough too, so to save time in making these little ham and cheese crescent rolls. 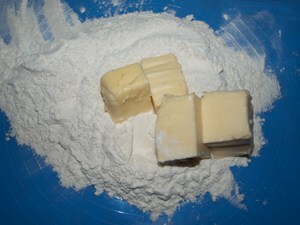 To make the dough place the Flour on a pastry matand add the Butter cubes. 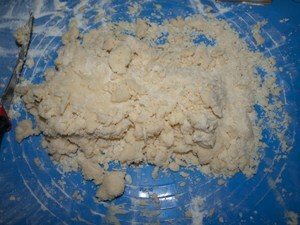 With your hands crumble the butter into the flour (as seen in the result picture). 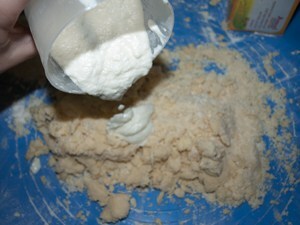 Add the curd cheese and pinch of Salt to the crumbled butter and flour mixture and start to form a dough. 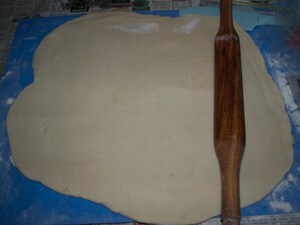 The end result should be a smooth soft dough. Use a kitchenaid if you prefer less mess and to save time. 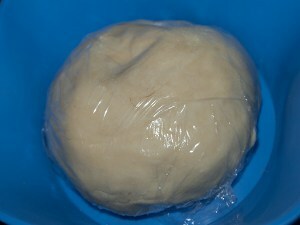 Place the dough in a bowl and cover it with clean wrap so that no hard crust gets formed on the surface. Keep the dough in the fridge for at least 30 minutes! 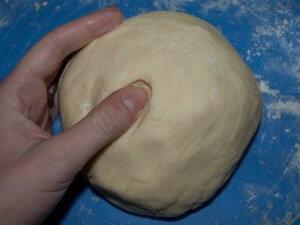 A cold dough is easier to handle and work with. Just before rolling out the dough, preheat oven to 200 Celsius/392 Fahrenheit . 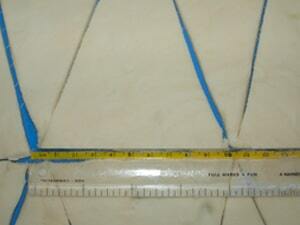 Once the dough is cold roll it out to a 0,3 millimeter/ 1/8 inch thickness. Create triangles with the help of a clean ruler. 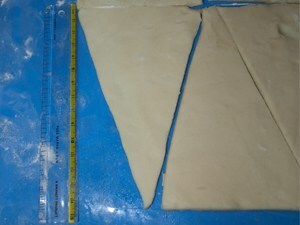 10 centimeter width and 15 centimeter height (about 4 x 6 inches) and cut out your triangles as shown. Now cut your ham and cheese slices into half. Take one Cheese half into your hand and roll it together. 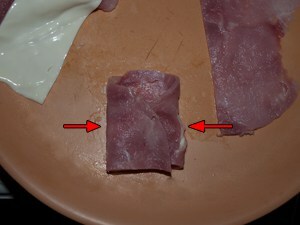 Take the Ham half into your hand and place the rolled in cheese into the center. 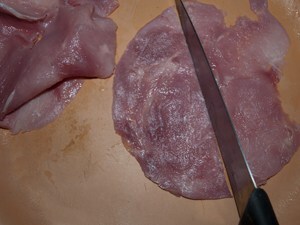 Fold the ham in at the side corners and on top, so that you have a little parcel. Do that with the rest of the slices. 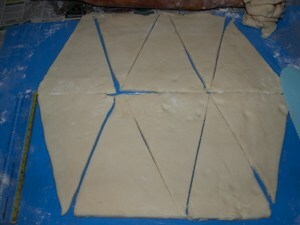 Place the little cheese and ham parcel onto one of the triangles. 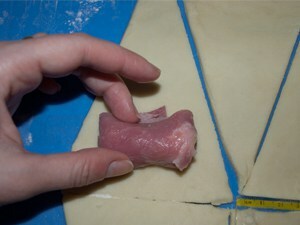 Start to roll in the cheese and ham parcel to form a crescent. The triangle ending should be at the bottom. 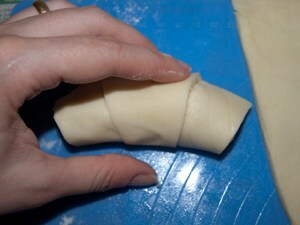 Shape it carefully into a slight crescent form and tuck in and close underneath the dough if open. It should be well sealed or the cheese will melt out and make a mess while baking! 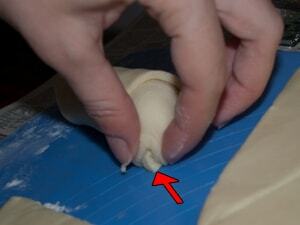 Do that with all little crescents. In a bowl break the egg and swirl it well. Dip into the egg with a kitchen brush and brush over the crescent surface. That will give the baked goods a nice shine and give a moist feeling. 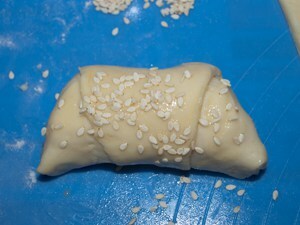 Sprinkle some Sesame seeds on top to finish the crescents. Serve hot as a Snack or even enjoy it as a breakfast/brunch treat! Dear Reader, do you get artisanal curd cheese in your local area? Please let us know in a comment further below. We love to hear from you! The Post, Ham and Cheese Crescent Roll, was first published on 3rd Feb 2013 and has been updated and enhanced ever since. You MADE your own crescents???? You are amazing! These look so darn good, Helene! They would disappear in my house in no time flat. 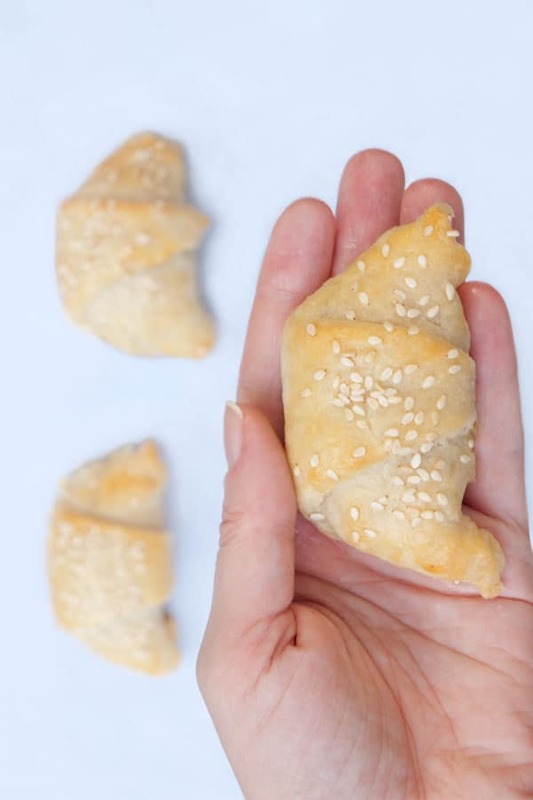 These crescents look so cute, and sound absolutely delish! I love this dough! 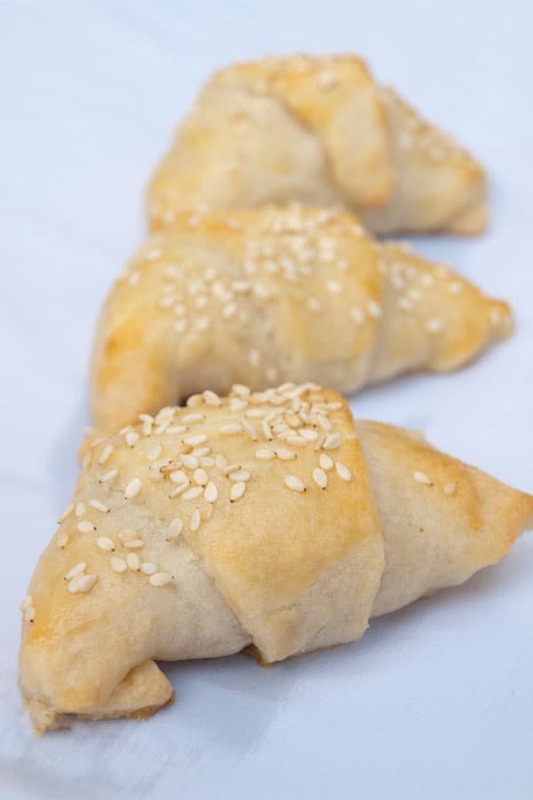 It must have tremendous flavor, and of course the filling for the crescents looks great too. Perfect for watching the big game! Or when you just want a fun snack. Thanks for this. I live in WI and there are dairies here that make Quark. I’ve never quite known how to use it but this looks like a great recipe to try! Thank you so much for the background and the recipe. Those are perfect looking, yummy!! I stared and stared and waited for one of those to jump out of the screen so I could eat one right now. Oh wow they look good. I’m loving the homemade crescent dough too. Gorgeous, just the thing to devour on a lazy sunday watching tv! Oh my gosh Helene, these are so beautiful. I love snacks like this. Right up my alley. Oh Helene,I’m craving for a bite of these so badly! !I love that the dough looks easy enough to make and your crescents look super cute!Great idea for any party! I love this dough! I bet it is amazing. Not sure I can get the ingredients around here, but they do look yummy! I love that you made these! How awesome! I can imagine how wonderful they taste. They are perfect as an appetizer or snack. 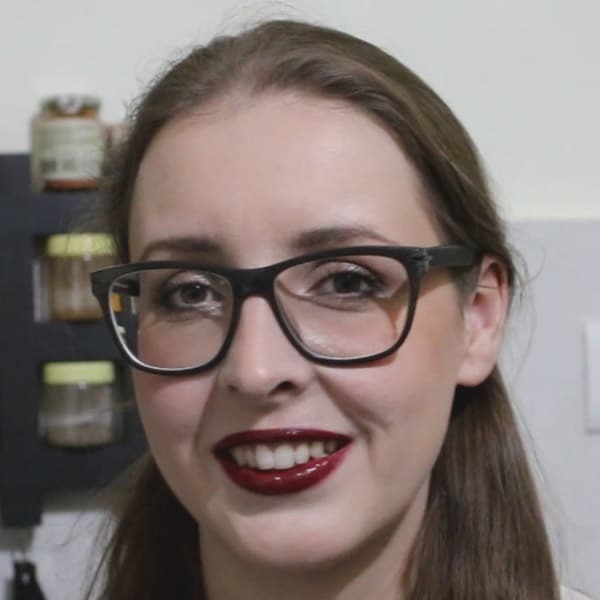 Thank you for telling us about Topfenmürbteig! I absolutely love this! Homemade crescents!!! Well, these are just downright yummy! 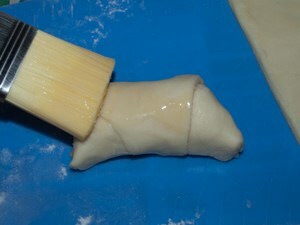 Thanks for the great instructions on how to make the pastry! It looks perfect! wow those look great! I could go for one of those for breakfast right now! Helen that is impressive. It looks so delicious and so perfect! Gorgeous you make it look so easy! This is really good stuff and perfect treats for entertaining. I love ham and cheese combination. Fantastic pictorial and instructions. Makes it so much easier to do this. What a coincidence, I made a cottage cheese pastry this past weekend too, and I’m about to make another because it worked out so well. I love that these are savoury. Nicely done. Hi Helene – I’ve gotta ‘fess up… I hate sports – *all* sports – with the burning passion of a thousand suns, but I sure do love snacks. I’d be the guy at the back of any sports party scarfing down more than my fair share of snacks while people were watching some important goal or something on TV :D.
These look like a love thing to serve – I bet they look so good all piled up on a plate! You didn’t specify what cheese you use – just said “cheese slices”, but I’m guessing some gruyere would be awesome! Oh my goodness that Cheese Curd Shortcrust sounds to die for! Perfect appetizer or game day snacks, such a winning combination. These would disappear in no time in our house. These look So easy and So delicious! I love that you made the dough from scratch instead of using that stuff that comes out of a tube. 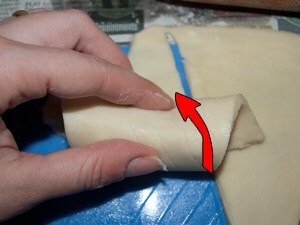 I love crescent rolls….but have never made my own. This recipe looks like a fun experiment for a rainy day. Playing in the kitchen is fun. Helene, we can buy Quark here in Canada. And these look like such delectably delicious little bites, that I can see a reason for getting some soon. Thanks for this yummy recipe! I can’t believe this is homemade. Looks so good!